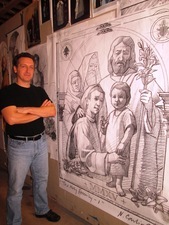 For his next project, Carlin has completed sketches for a series of figures that will be installed in an Illinois church. Last January, Carlin was contacted by Bishop John McIntyre to paint a portrait of the Holy Family that would be the central icon for next year's World Meeting of Families in Philadelphia. The gathering of Catholic clergy, leaders and families from Sept. 22 to 27, 2015 will bring a global spotlight to the city, and Carlin's painting will be front and center in the festivities. He started sketching in the spring. time for a Sept. 7 debut and blessing at a mass in Philadelphia, where the painting will be blessed by Archbishop Chaput and revealed to the world. For the media, only the sketch is being shown for now. Carlin said the design of the piece has changed very little from his initial sketch – one of two that he submitted. “I started to question myself,” he said. “Wow, did I hit a home run the first time out? I presented two sketches, they were happy with both, they picked one and it's changed very little since that first sketch. They were very pleased with the direction. Of course, with rumors circulating that Pope Francis might attend the 2015 conference, Carlin can only guess. “I know of various news reports, but that's well beyond my pay grade,” he said, laughing. “Everyone will be pleased – Cathoic and non-Catholic – if he comes. 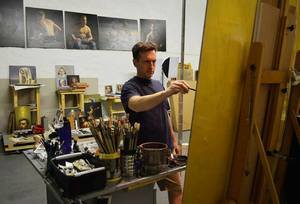 And I assume he will see my painting at some point.” If Pope Francis does see the painting in person, it will be a crowning achievement in Carlin's career, which has come to focus almost solely on commissions for churches. With the global exposure that the 2015 World Meeting will receive, Carlin's list of commissions could well fill up even more than it already has. “We'll have to see where it goes,” he said with a shrug. 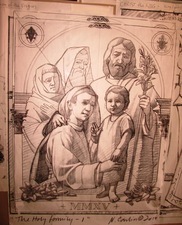 Next up is a commission for life-size figures that will be painted and installed in niches in an Illinois church. The sketches are laid out in his studio, awaiting his brush. Carlin will be at the unveiling mass in Philadelphia on Sept. 7 – “The whole clan will be there in our Sunday best,” he said with a smile – and he will be as involved in the World Meeting as the organizers want him to be. For more information, visit www.worldmeeting2015.org, or www.neilsoncarlin.com.